Recorded: Chipping Norton Studio and Courtyard Studio, Oxford, England. Quick Summary: Radiohead's debut album is widely regarded as 'good' but nothing more. Though die-hard fans love it and almost everyone likes a few songs, the general opinion is that it was the worst of their 4 albums so far. A new band with no success under their belt, Creep rocketed them to fame in the US and Pablo Honey soon followed. The album isn't bad, and is excellent for a debut. In my opinion, though, it feels a bit rushed. Every song has its merits, but the overall feeling is that it could have been better. However, Pablo Honey reeks of Radiohead's obvious potential to do better. Released in 1993, Radiohead's first album didn't exactly rocket them to fame. Most of the publicity for it came from the one and only hit single of the album, Creep. Pablo Honey was released to mixed reviews, but after releasing a few more singles the band grew a small following. Radiohead started out on a European tour when it heard that Creep had become a hit in the US. As soon as band members learned this, they packed their bags and left to tour America extensively. As an opening act for Belly, and Tears For Fears. Though Creep was the reason Radiohead became a success, many critics claimed they were one hit wonders. Pablo Honey went gold, and Creep was re-released in the UK to wider acclaim, but none of the other singles really made any impact. It seemed Radiohead would be remembered for that one song, alone. And at the time, this was an understandable opinion. 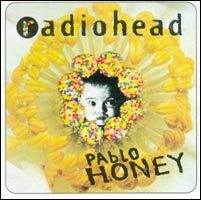 Pablo Honey peaked at #25 in the UK charts, and #32 in the US charts. Overall it isn't the strongest of albums, but for a debut it has many merits and displays huge potential for the band which went on to much greater things. Pablo Honey is a good album. The mood is constant, and the message 'life isn't very good' is easily brought across. Though Creep was the only hit single of the album, no one can accuse Radiohead of creating a disc with a single, and fillers. The other tracks are all good. They don't compare to Creep in my opinion, but they aren't just melodies to fill space for an album made to host one song. Just as much effort has been put into the whole album. I think Radiohead could have done better, with the tracklisting. I personally prefer some of the Pablo Honey b-sides to tracks that made the album. But I think at the time, Radiohead were a relatively new band. Creep had shot them to fame, and they were under pressure to produce an album to go with it. No one can say they didn't try. I just think the band were maybe not experienced enough yet to realise their full potential for an album.